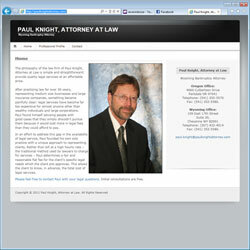 Client: Paul Knight, Attorney at Law. Project Scope: After practicing law for over 30 years, representing medium size businesses and large insurance companies, something became painfully clear: legal services have become far too expensive for almost anyone other than wealthy individuals and large corporations. Paul found himself advising people with good cases that they simply shouldn’t pursue them because it would cost more in legal fees than they could afford to pay. Design components: Paul is a good friend of ours and he wanted a very simple site so we used a Word Press theme that he liked and used it to produce the new site in conjunction with his content.